We’ve had a pretty relaxed day today. The weather is great and the skies are clear except for a few clouds around the top of the mountain. We completed a nice hike up to 12,900ft/3,932m where we got a spectacular view of Aconcagua’s south face. Just a few days of hiking and sleeping at elevation has made a noticeable difference in everyone’s energy. As we acclimatize, life at altitude becomes much less challenging. Now we are all relaxing at Confluencia camp for our second night here. 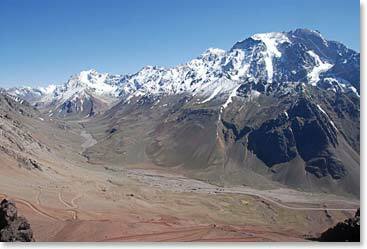 Tomorrow we will head up to our base camp for this climb, La Plaza de Mulas. 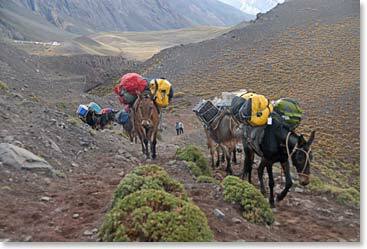 We have to get up early to have our bags packed for the mules that will take them to base camp for us. We will keep you informed as we climb higher up the mountain!